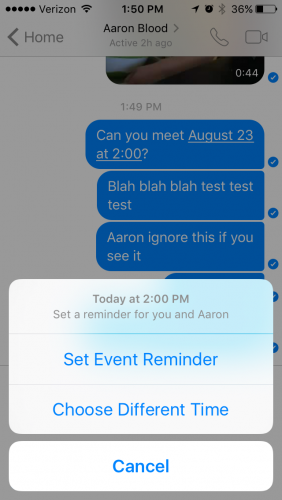 If a Facebook Messenger thread has a date and time in it, you can use that to create a reminder for everyone who is included in the thread. The reminder will be sent through Messenger to everyone who is in on the conversation. Facebook Messenger is a great mobile app for group communication. With 900 million users, Messenger will connect you to most of your friends and allow you to send pictures, stickers, videos, and links in a convenient way. 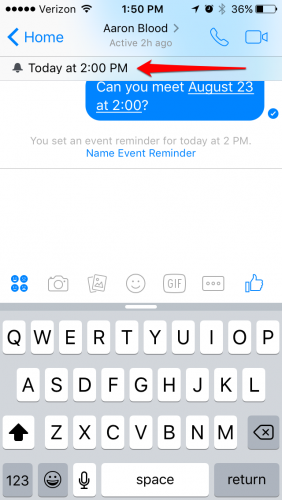 When discussing an event on the app, create a reminder directly from your conversation so that no one will forget about it. 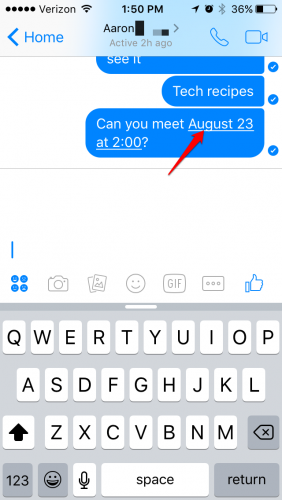 1.In the Facebook Messenger app, find a message that has a date and time in it. The app will help you out by underlining text that it recognizes as a date and time. Tap the underlined text. 2.Choose Set Event Reminder if you want the reminder to go off at that exact time or Choose a Different Time if you want to set the reminder to go off 15 minutes or so before the event. When you choose the latter option, you can set the reminder for any date and time. 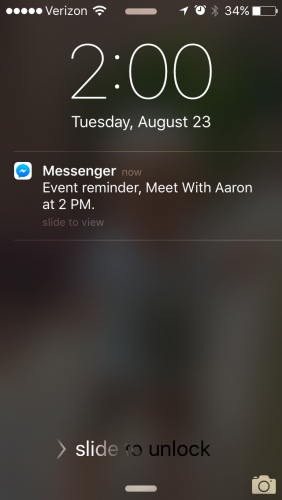 3.Now the reminder will show at the top of the screen while you have the conversation open. You can tap it to give the event reminder a name so that everyone is on the same page. The name that you give the reminder will be what pops up in the reminder notification. 4.The reminder will be pushed through to everyone’s phones at the date and time you set. Everyone’s phones may have different notification settings, so if they have messenger notifications turned off, then they will not receive the reminder. Do you have any other Facebook Messenger tips or questions? Leave a comment below, and the Tech-Recipes team will help you out.